Makarabas were immensely popular during and after the South African Soccer World Cup in 2010, as you can see in the image below. 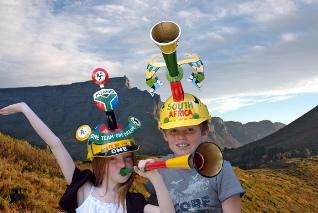 A makaraba or makarapa, is the artfully created headgear of the South African soccer fans. You can also call them fan helmets. 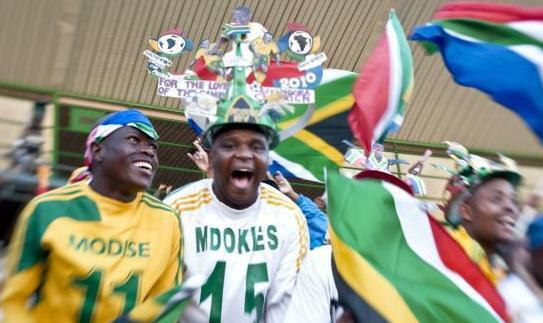 Soccer in South Africa is supported by loyal fans who do not only wear their teams colors but also create their own headgear to show their support. What does the word makaraba mean? The word is taken from the local word for miner’s hard hats. Originally the term was used to describe workers who went away to seek work, mainly at the mines. Later the term was used for the hats the workers wore, namely miners’ hats. Where do the hats originate from? The word which was originally used to describe the hats of the South African miners, is today used to describe the colorful protective headgear at soccer games. Read more about the soccer matches at Cape Town stadium. South African soccer fans used to take the hard hats to the soccer matches to protect their head against these flying objects. So the hats were originally used by the rival soccer fans in Johannesburg and Pretoria. Because the hats looked pretty boring, the idea of decorating the hard hats was born. Luckily nowadays most of the matches are peaceful and the beautiful fan helmets now only serves as decorative headgear. In Cape Town the fan helmets are now created with builders' hats, which are much easier to cut and work on than the stiffer miners’ hats. 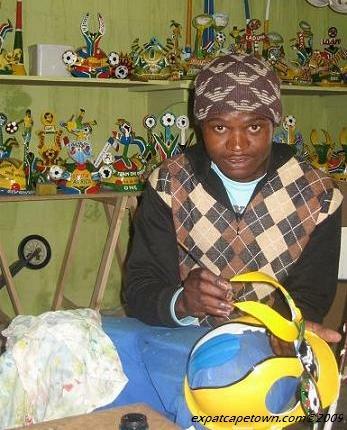 Soccer fans in Cape Town decorate their fan helmets for soccer matches of their favorite teams. The hats are created and traded in the townships and there are some special design features the local artists incorporate. Who makes the beautiful hats in Cape Town? These wonderful hats were designed and created by some local artists under the supervision of Cape Town graphic designer and artist Michael Souter of Makoya Makaraba Designs. Michael who already made paintings of soccer fans with their stunning headwear, had the idea to make them a valuable soccer souvenir in Cape Town. With his desire to uplift talented but disadvantaged young people from the townships in one big social project, he wanted to create jobs and opportunities for talented young black artists while raising awareness of the local soccer culture as well. Here on this picture you see one of the painters, Nathaniel, working on a new design. How long does it take to make one hat? Usually several people are working on the hats. They have to decide upon the design, do the cutting and priming of the hats and later the painting. What was amazing to see was how Mischak, one of the workers, visualizes the design of each hat. Then the hat gets cut and primed before the different colors and designs are applied. Finally Michael Souter always has got a good check of the hat’s quality before the brightly colored hats are ready for sale. So altogether it takes about 4-5 working days to finish one makaraba. If you like to learn more about the brightly colored hats, see the video with an interview of Michael Souter here. This 5mins long video by CNBC is a gem, it will take some time to upload, but really interesting to watch. Enjoy! Where can I get one as a souvenir or order a collection? At the moment your best bet is to equire directly at Michael Souter's website. There were many different amazing designs on offer and should you want to have some own ideas or logos incorporated on your hat, this all can be discussed and in about four to five days your hat will be ready for delivery or pick up. I was really impressed during a tour of their premises some years back! Thanks so much Rona! And remember: Soccer in South Africa is unthinkable without Makarapa! So better order them now, I am sure they will be a winner at next years’ world cup too. Did you enjoy reading this article, then how about reading more about South African Soccer in Cape Town?